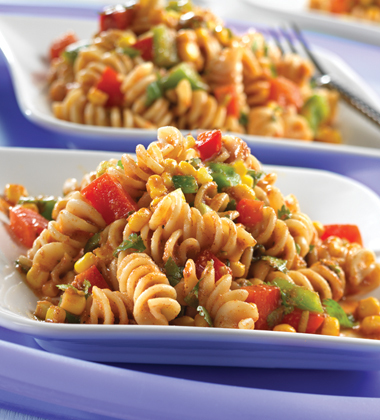 This spiced up pasta salad uses V8 as a dressing base with Southwest seasonings. 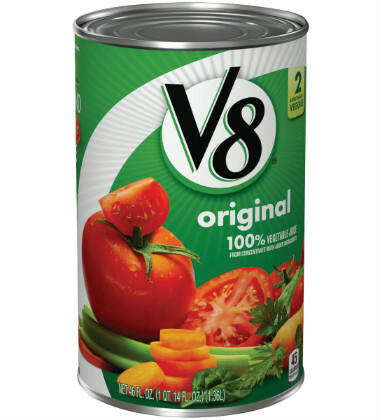 Delicious with any pasta or vegetable combination. chili powder, toasted	 2 tbsp. 1. In a large bowl combine juice, olive oil, vinegar, and spices. Mix well. 2. Add corn, peppers, scallions and cilantro. Let mixture stand refrigerated at least 2 hours. 3. Add pasta and cheese to vegetable mixture and toss to coat. 4. Using two #8 scoops, portion one cup onto plate. CCP: Refrigerate below 40°F at least 2 hours before serving. Great side dish for grilled fish or chicken.